Create one-of-a-kind greetings, invitations, and announcements that compliment your personality and style. Our two sided photo cards can be personalized front and back with photos, text, or even your own artwork. Choose from a wide variety of templates for any occasion and send out photo cards with a professional flair that your recipients are sure to love. If you’re looking for photo graduation announcements with all the custom options, you’ve come to the right place! Upload your senior’s best photographic moments and create the perfect announcement to invite your guests to the upcoming ceremony and party. You can design your grad cards with senior portraits or a random selection of your favorite photos from your high school years. Then incorporate them into your chose card design, add your text, and place your order! Print Shop makes custom photo card printing as easy as 1-2-3! For Mother’s Day this year, make Mom a one-of-a-kind card that compliments her style. 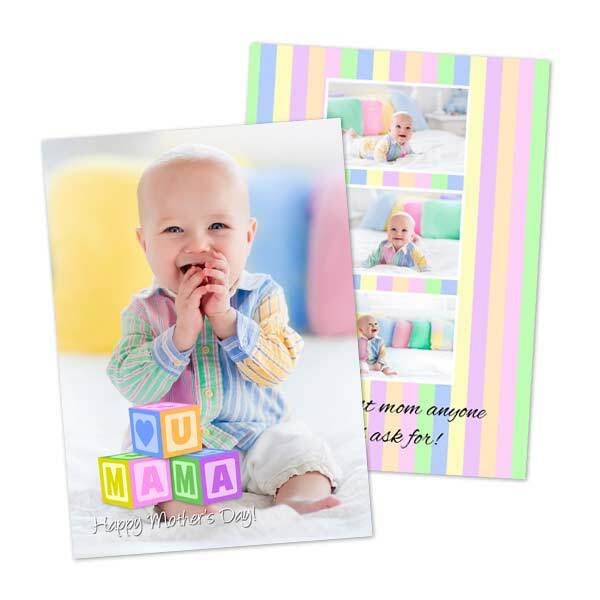 We offer multiple Mothers Day photo card templates in an array of styles and colors. Pick out a favorite picture, or upload a series of Mom’s favorite memories to create a collage for the front of your greeting. Our double sided cards can be printed on the back as well with your own personal message. For custom Mothers Day cards and gifts, Print Shop has you covered! With a few simple steps, you can create a personalized Father’s Day card that features Dad’s most cherished memories. Upload a favorite photo from your fishing trip last summer. Or, find a cute photo from years ago to bring an old memory to life. No matter the picture, you can upload it to Print Shop and incorporate it into one of our many card designs! Then use the back to write your own personal message using our text feature. We offer a wide range of custom options including borders, text fonts, backgrounds, and more. Or, you can create your own Father’s Day photo card from scratch! In addition to cards, we also offer unique gifts for Dad including personalized T shirts, photo laptop cases, custom photo coasters, and much, much more!